By the time Wim reached his teenage years, he was already running barefoot through the snow, comfortably.. It was the beginning of a large series of confrontations with the cold, where every single time, limits were tested, stunning the outside world. 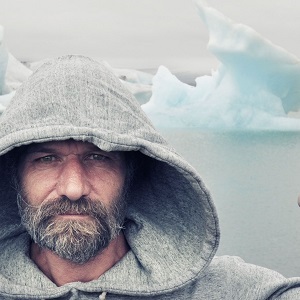 Wim Hof (born 1959) is able to perform exceptionally, almost unnatural, on what he is focused on. Due to our lifestyle today we are far removed from our natural bodily condition. We breathe much more shallow which means that our body is not optimally supplied with oxygen.. According to Wim, it’s not complicated at all: “What I am capable of, everybody can learn”. Summary: Wim’s answer to the five questions! Listen to the full conversation on the player above; also available on iTunes and Stitcher. Hope is a positive energy which influences directly on the DNA positively. Always hope because your chemistry is influenced the right way and finally when the chemistry gets enriched because of our mind, the mind is very capable to influence into cell level. My definition of hope is JUST DO IT. Right now many people. I got so much love, so much dedication, so much intense devotion of so many people because they love the science behind it. Years ago, it were my children who gave me hope. I lost my wife in ’95. I had four children with her. I loved her literally to death, but I had to deal with the loss. I needed a whole lot of hope. I needed a whole lot of love to work this out – a broken heart. They gave me a whole lot of hope, love, energy, life and I healed. Society, most of the time, is very stressful and very fast going. You have to deal with the goals and you have to commit to everyday life. There’s very little hope or there’s very little space and ability to work things out when you need love and hope of people. The children, they needed attention. The children, they needed a daily life with safety and love brings safety. Attention brings safety and thus they gave me hope. When you go on with the energy that way, you take care of the children, hope arises again. Everything is going to work out. That is an irrational feeling, but that is very, very there. My children, they gave me back my life and thus right now, I am very powerful because I show scientifically that we are able to tap in deeply into our physiology and into psychic physiology and thus give hope to everybody. Just be alive. Make jokes. Make heavy things light. Bring light every day. That’s the only thing. The rest is scientific research. I’m really into scientific research to take away people’s doubts that happiness, strength and health are possibly physiological and chemical. We just completed a study in pain in my country wherein the breathing techniques are able to tolerate pain very much higher. Twenty people were given senses and electrodes on the body, somebody is erasing their pain signal and they were very able to control that. It gives hope to 2.2 million people just in Holland. It’s a big thing as well to people with chronic disease. They are hopelessly looking for a way to relieve themselves from pain. We just completed this study. This is the way we give back hope, strength and sense of trust – that every individual is able to control and to go deeper within and be happy, strong and healthy instead of being hopeless and powerless about it. Breathe consciously, deeper. Compensate the shallow breathing reflex you have because you have clothes – there is no interaction with nature.